During the last week of December, A large storm hit Leelanau county and brought strong winds along with it. The sky was complete overcast for the two days the storm endured, but when the sky began to clear, a wonderful light started to shine through. The day after the storm was filled with lovely cloud cover, however the effect the wind had on the lake was still very apparent, large waves still crashed towards the shore. The wind was low, the sky was clear, but the size of the waves were fairly large considering the days calm appearance. The use of a slower shutter speed gave the water a strong sense of movement. 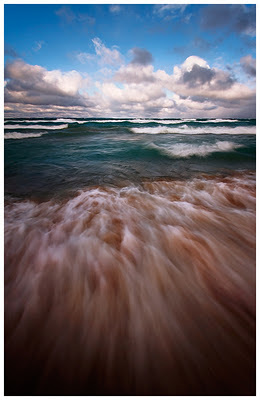 I hope everyone enjoys this photograph of Lake Michigan from Vans Beach in Leland, Michigan. Technical details: Canon 7D, Canon 10-22mm lens (@10mm), ISO 100, F/8, 1/2 second exposure.